This composite image shows the asteroid 243 Ida as seen from the Galileo spacecraft during its approach on August 28, 1993. The six views were shuttered through the camera's green filter and show Ida's rotation over a period of about 3 hours 18 minutes. 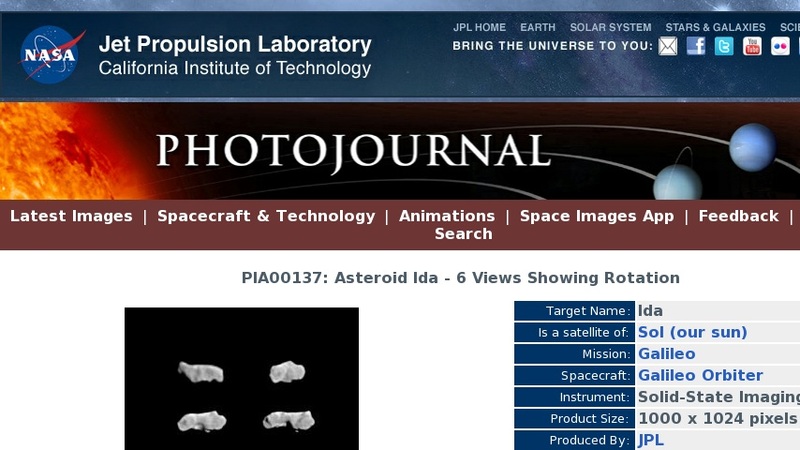 The asteroid makes a complete rotation every 4 hours 38 minutes; therefore, this set of images spans about 3/4 of Ida's rotation period and shows most of Ida's surface. By combining the information in these views with that from the highest resolution images returned from the spacecraft in September 1993, the size and shape of this irregular body can now be determined accurately The asteroid appears to be about 58 kilometers (36 miles) long and about 23 kilometers wide, with a very irregular shape and volume of some 16,000 cubic kilometers. The images are arranged in chronological order from a time 3 hours 51 minutes before closest approach (upper left), through upper right, middle left, middle right lower left and lower right (33 minutes before closest approach). The six images show Ida at the same scale throughout. Ida's rotation axis is roughly vertical in these images, and the rotation causes the right-hand end of Ida to move toward the viewer as time progresses. The first image was taken from a range of about 171,000 km (106,000 miles) and provides an image resolution of about 1,700 meters per pixel (the highest resolution achieved for Ida is about 25 meters per pixel). The second, taken 70 minutes later, is from 119,000 kilometers, followed by 102,000 kilometers, 85,000 kilometers, 50,000 kilometers, and 25,000 kilometers. The features on Ida are less sharp in the earlier views because of the greater distances. Prominent in the middle three views is a deep depression across the short axis of the Asteroid. This feature tends to support the idea that Ida may have originally been formed from two or more separate large objects that collided softly and stuck together. Also visible in the lower left view is an apparent linear albedo or reflectance boundary. Color images yet to be returned from the Galileo spacecraft may help resolve the question of whether or not the two ends of Ida are made of different materials.